The folks at King Arthur Flour call these their “Best Fudge Brownies Ever”. Pretty big talk, don’t you think? As one who enjoys a good brownie I was definitely game to bake up a batch and see for myself. Did they live up to all the hype? Well, that depends on how you like your brownies. If you think brownies ought to be rich and chocolatey, dense and chewy… if a shiny, crackly surface that begs to be broken through with a deftly-wielded serrated knife (or just your eager mitts) is at all inviting to you… if the sight and feel of soft, melted pockets of semi-sweet chocolate cropping up intermittently like decadent little presents makes you stop whatever you’re doing to sit down and savor the goodness …and if, from a highly practical standpoint, you value the ability to remove all of this wonderfulness quickly and easily from its baking pan without any sticking at all…then YES, you will conclude, as I did, that these are, in fact, the BEST FUDGE BROWNIES EVER! In a medium-sized microwave-safe bowl, or in a saucepan set over low heat, melt the butter, then add the sugar and stir to combine. Return the mixture to the heat (or microwave) briefly, just till it’s hot, but not bubbling; it’ll become shiny looking as you stir it. Heating the butter and sugar a second time will dissolve more of the sugar, which will yield a shiny top crust on your brownies. Transfer the mixture to a mixing bowl. Stir in the cocoa, salt, baking powder and vanilla. Add the eggs, beating till smooth; then add the flour and chips, beating till well combined. Spoon the batter into the prepared pan. Bake the brownies for 28 to 30 minutes, until a cake tester inserted into the center comes out dry (though it may have a few crumbs clinging to it). 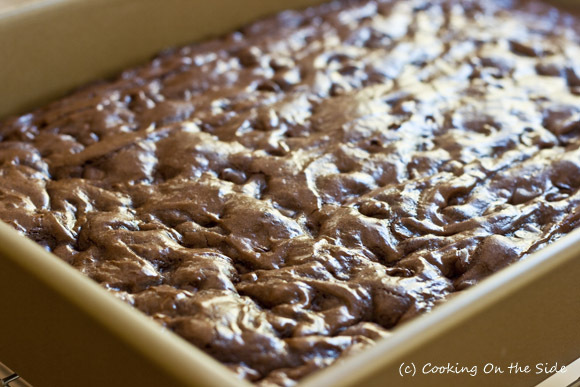 The brownies should feel set both on the edges, and in the center. Remove them from the oven, and after 5 minutes loosen the edges with a table knife; this helps prevent the brownies from sinking in the center as they cool. Cool completely before cutting and serving. I knew it was the recipe from the bag! I’ve wanted to make these forever–now I’ll be sure to get to them soon. They look fabulous! Elle’s last blog post..Guacamole Ice Cream…sort of! I will definitely try these! I have all the ingredients in the house… maybe tonight after the kids go to bed. (I will save some for them tomorrow LOL) But I am a fudge brownie gal totally, it is one of my favorites!! These look amazing! I am hungry just looking at the picture! I love a nice crackly top! I’m afraid to make these… because they do look like the best ever, and will have absolutely no self-control around them! But what I love is that I buy this flour all the time, and never bother to look at the recipe on the package. Thanks for making me look. How do these brownies taste after they are frozen? Did you freeze individual servings or an entire “half” pan? They froze really well. I cut them into bars and wrapped them individually in press & seal wrap before putting them in a plastic freezer bag. I totally agree! I’ve made those before and everyone who’s tried them has agreed – they’re the best! Oh yes, these look just about right! Love it! Best fudge brownies ever? Just the title alone warrants trying these… they look fabulous! That’s very good to know – now I’m really eager to make a lot of their recipes! I have so many bags of KA (stocked up since TJs discontinued it). I will have to try. They look amazing!!! I just made these… and they’re fantastic!! Isn’t that recipe incredible? So glad you liked them too! I love the concept of your new site. I wish I had found it earlier. These brownies look amazing! They look amazing! How long do you think they would take in the oven if they were cupcake sized? I imagine they’d take a little less time to bake them in a cupcake pan. I’d definitely keep a close eye on them through the oven window – as long as you do the little toothpick test for doneness you should be fine. Good luck! Mary, you just might have the best job on the planet!! What is the consistency of the batter like? Is it on the liquidy and pourable side, or is it a little denser? I’m toying with the idea of adding a layer of caramel to the center of these (I know, I know…I’m asking for a dessert coma), but that usually tends to work best with a thicker, drier batter. Wow, a caramel layer! That might make these the Best-est brownies ever 🙂 I’d say the batter is on the denser side, kind of sticky. Definitely not liquidy like a cake batter. My guess is it could probably support the caramel. Would love to know how it comes out! The batter worked quite well at supporting the melted caramel. It was a bit on the moister side than the usual batter I use to make caramel brownies with (which caused it to be a messy process), but the end result was just fantastic. I will definitely be making these again! do u have any idea what might went wrong? Hmmmm…the only thing I can think of is maybe you accidentally left out an ingredient? I’m known to do that myself quite often! Or maybe your sugar didn’t dissolve quite enough to get the shiny top? Mmmmmmm, they look mouthwateringly tasty! 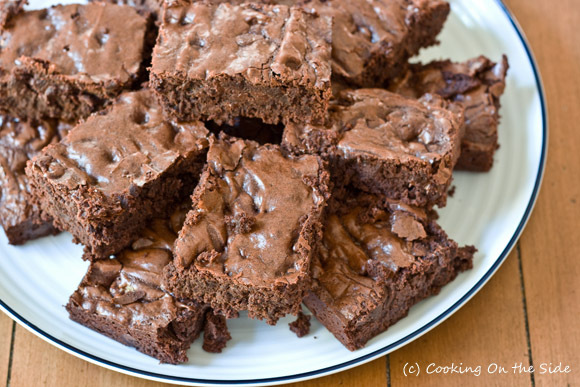 Your fudge brownies look extraordinary yummy. Thank you for the post and the pictures. .-= A-Man´s last blog ..German yeast dumplings =-. I make these whenever I need brownies for something, like today when hosting 10 students for a recital. Most of the time I use either half or all Ghirardelli Sweetened Cocoa instead and it comes out extremely scrumptious. Thanks for posting it as it has become an entertaining staple around here! .-= Karen´s last blog ..Enter Leroy, Stage Right =-. I’ve made these before, and they are my go-to brownies. I love making them, and I love the process of melting the butter and sugar together. I recognized these brownies as soon as I saw the crinkly top. YUM!! Lovely photos and blog you have here! Oh my goodness! You must have missed an ingredient somewhere along the way. The butter and sugar should have definitely been syrupy when you heated it. And the batter should have been thick, not runny. I will definitely try again. The Batter tasted great but the texture was a disappointment for me. It could also be that I used my mixer – I’ll try mixing batter by hand. Maybe it would prevent it from rising too much. Will let you know how it turns out. thanks for the great recipe I can’t wait to try it out! I’m so glad you tried it – they weren’t just bragging when they named it “best ever”, right? The best brownie recipe I’ve ever tried. Just follow the instructions to the letter. The trick is using the right type of chocolate. I used “cebe cacao edles aroma”. Add 1/4 cup of brewed coffee and OMG !!! Richer deeper chocoalte taste , the bomb! Sounds like there must have been a missing ingredient that second time around!